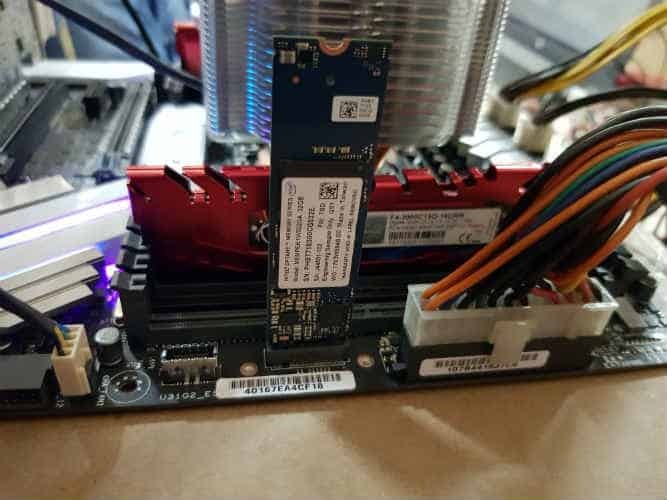 Intel announced its Optane memory module a few weeks ago. The SSD has several capabilities to enhance the boot speed of your PC or Laptop as well as it helps applications to load fast. Intel Optane memory is a smart, adaptable system accelerator for PCs. It provides uncompromising system responsiveness for large capacity storage drives, making everything you do fast, smooth and easy. The Intel Optane technology accelerates applications for fast caching and storage, reduce transaction costs for latency-sensitive workloads and increase scale per server. Also, allows data centers to deploy bigger and more affordable datasets to gain new insights from large memory pools. We installed the drive in our test bed (Intel Core i7 CPU, 4 GB Kingston DDR3 RAM, Windows 10 OS and Cooler Master 350 Plus). In our random test in which we transferred the assorted 3GB data from our HDD drive to this 32GB SSD drive and the speed we got was 197MB/s and the time it took 15 seconds. Intel promises for Sequential Read (up to) 1350 MB/s and Sequential Write (up to) 290 MB/s speed, let’s see how it performs in our test results. 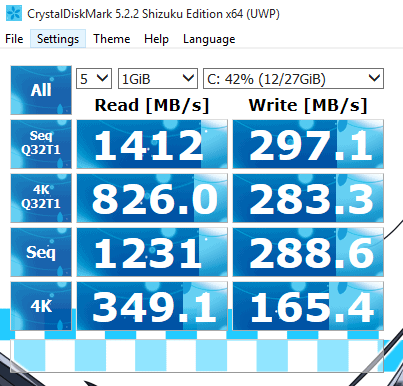 Running the benchmarks, it performed well on Crystal Disk Mark (sequential) it gave 1412 MB/s read and 297.1 MB/s write speed. 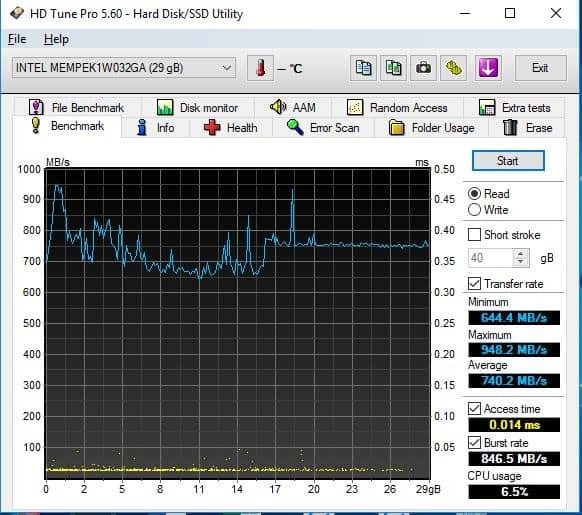 And with HD Tune Pro, it delivered maximum and minimum read speeds of 948.2 MB/s and 644.4 MB/s respectively which almost double if you compare it with normal SATA SSD drives. Both scores are higher than what Intel claims, meaning you would get even better performance than Intel claims.